In response to its research showing that acquiring 3D design skills is a major hurdle for educators looking to use 3D printing in their classrooms, MakerBot yesterday published a handbook designed to provide educators with a wide variety of ideas, activities and projects. MakerBot in the Classroom: An Introduction to 3D Printing and Design includes an introduction to 3D printing and a range of hands-on 3D design lesson plans. The book is available as a free digital download for registered MakerBot customers, and a sample project chapter is available free to anyone who registers on MakerBot.com. In conjunction with the release of the handbook, the company launched a new MakerBot Education landing page featuring real-world MakerBot stories, videos and challenges for teachers and students. 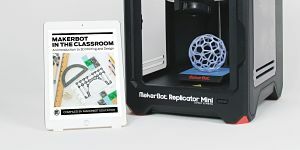 MakerBot in the Classroom is divided into three sections: The first section covers how MakerBot Replicator 3D Printers work and the technology behind them. The second section shows how to download, scan and design models to print on a 3D printer. The third chapter features multiple projects for teachers and students to design and print in 3D. Each section provides background knowledge, learning objectives, terminology, sample activities and discussion materials. Each project introduces a different type of free 3D design software, including Tinkercad, OpenSCAD, Sculptris and 123D Design. Each project also has a section that offers guidance on tying the project further into curriculum.